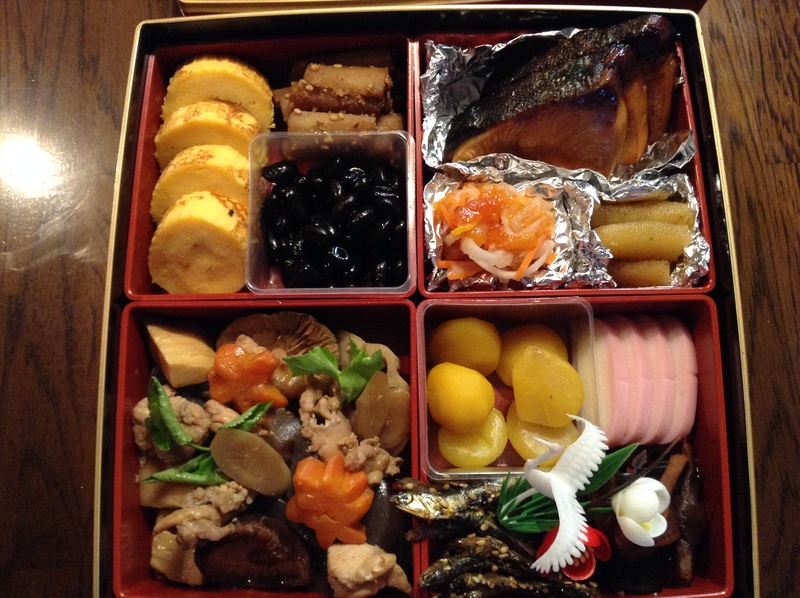 As we were busy with Food Sake Tokyo tours through the end of the year we only had December 31st to prepare the osechi ryori, Japanese New Year’s cuisine. First thing on the morning of December 31st we went to our local depachika and picked up last minute ingredients. The department stores are always packed on the last few days of the year as people are shopping for food for January 1st. January 1 is the one day a year that many department stores and other retail shops will close. Working in food retail it is a busy day. I enjoyed my two years working at Takashimaya on these days as many regular customers would come in to pick up sake and wine for the holidays. First, we started with making dashi from Hidaka kombu and katsuobushi. The kombu is saved from the dashi and used for making kobumaki (yes, spelled without an ‘m’). 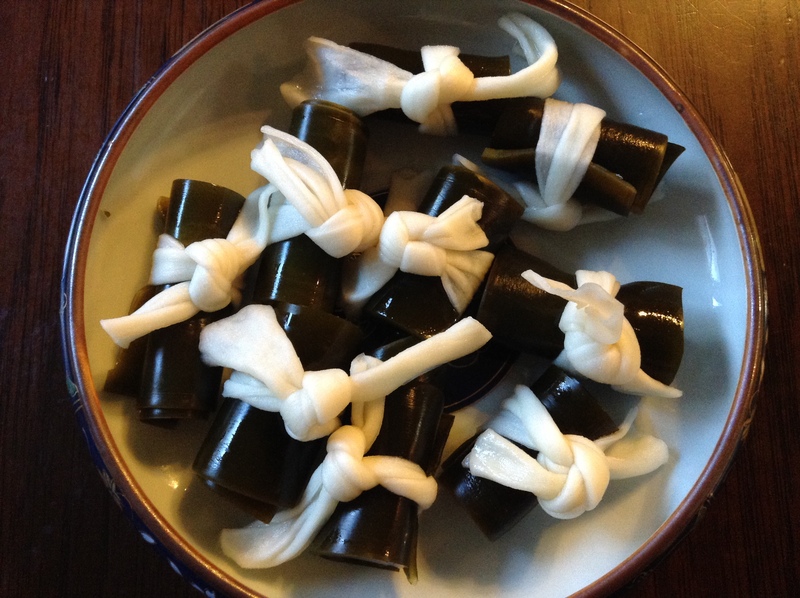 The kombu is wrapped with kampyō and then simmered in a sweet soy broth until tender. 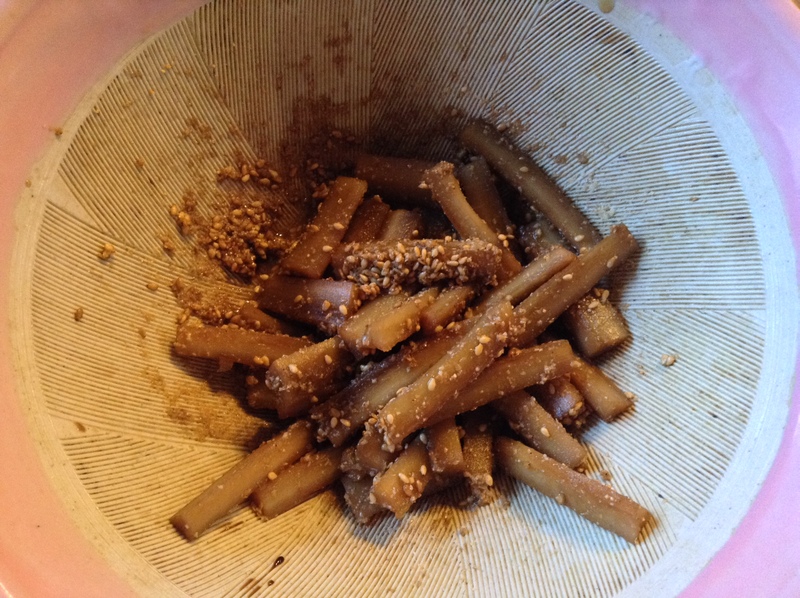 Gobō, burdock root, is simmered in water until almost tender, then finished cooking until soft in a dashi broth. It is then tossed in a sweet sesame dressing. This dish is called tataki gobō. This year we couldn’t find our vegetable cutters to make the pretty plum blossom shapes from carrots, so made it from scratch. Much harder to do this way of course, and the results not as pretty as they could be. These carrots will go in the simmered chicken dish. 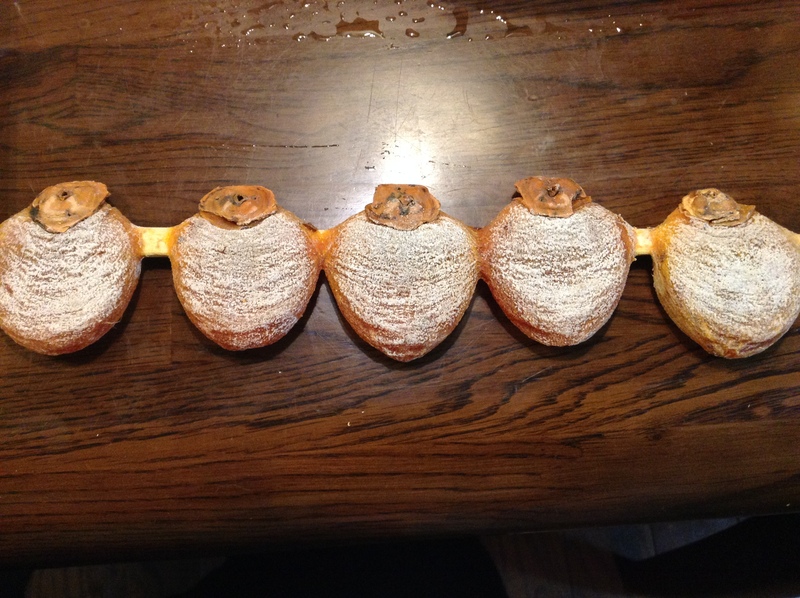 Hoshigaki, dried persimmons, are lovely when used in pickles. These will go with julienned daikon and carrots for a colorful namasu that is seasoned with a sweet rice vinegar and yuzu. 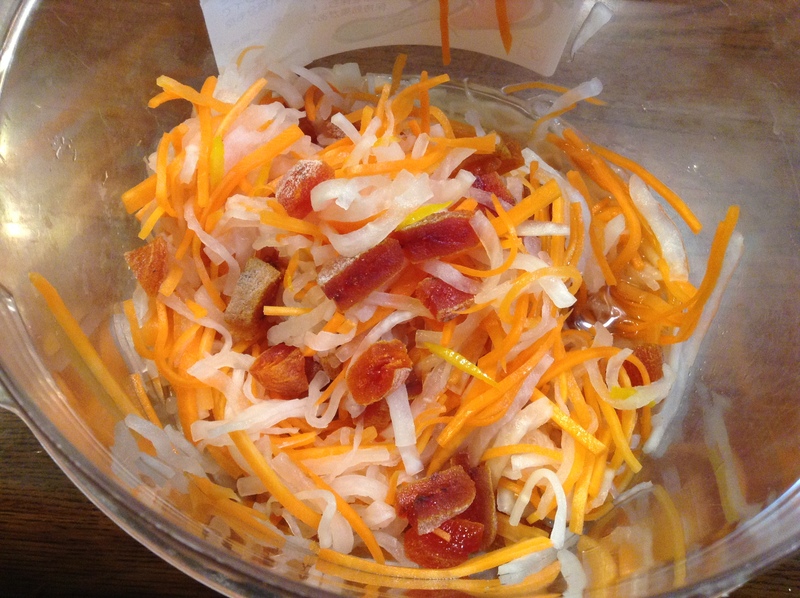 The dried persimmons with the carrots and daikon before being pressed in the pickle pot. 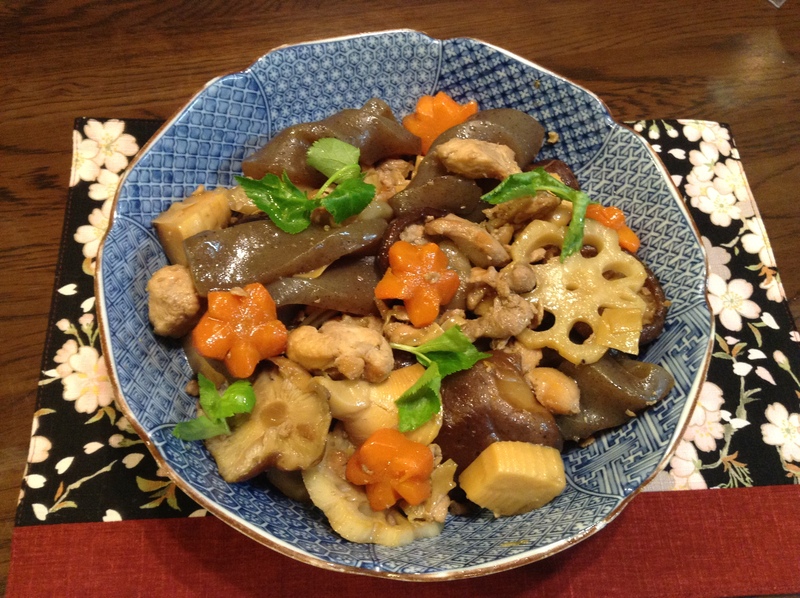 The iridori is savory simmered dish of chicken, carrots, burdock root, bamboo shoots, konnyaku, and lotus root. The store was sold out of snow peas so we added the green with mitsuba. 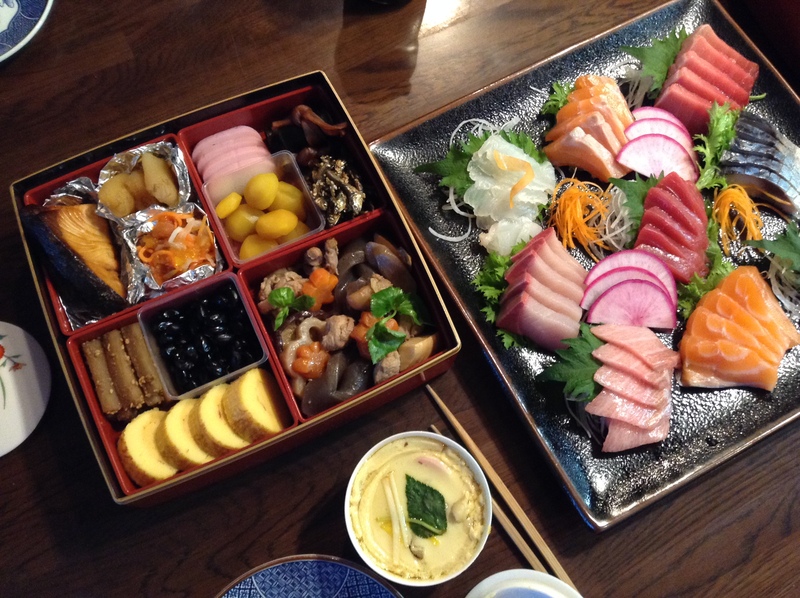 Most of the dishes are prepared on December 31st and assembled into the lacquer boxes. On the morning of January 1 we grilled buri (yellowtail) in a teriyaki glaze. Here is the assembled box. We made two layers this year. Here you’ll also find a sweet omelet, datemaki, that is made with happen, eggs, and sugar. 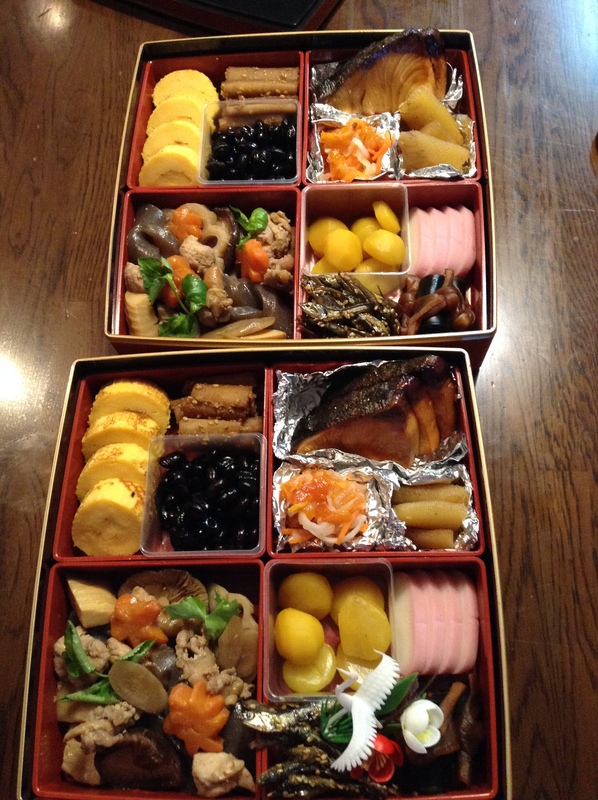 The boxes are completed with sweet black beans, kazunoko (herring roe), chestnuts in a sweet syrup, kamaboko (steamed fish cake), tazukuri (dried fish in a sweet soy with sesame seeds), and the dishes mentioned above. Many of the components are on the sweet side. At Izakaya Sakamoto we also served with the osechi ryōri a savory egg custard called chawanmushi, a soup made with mochi, and sashimi of flounder, sea bream, salmon, yellowtail, pickled Pacific mackerel, and three parts of tuna – akami, chūtoro, and ōtoro. For more information on the different dishes often used in osechi ryōri, please read this piece I wrote for bento.com about ten years ago. We wish our friends, Food Sake Tokyo tour clients, and blog followers the best for a year filled with delicious meals – and hopefully a visit to Tokyo. Looks amazing, Yukari! Thanks for posting this, all your other fantastic posts, and have a great 2014! Arigato! I am surprised we pulled it together in a short amount of time. The final product looks delicious. I am definitely missing being in Japan for New Year’s this year. 明けましておめでとうございます to you and your family! Arigato! And to you too, Mandy! Hope your travels bring you to Tokyo. What a lovely post. Thank you for sharing all the photos. 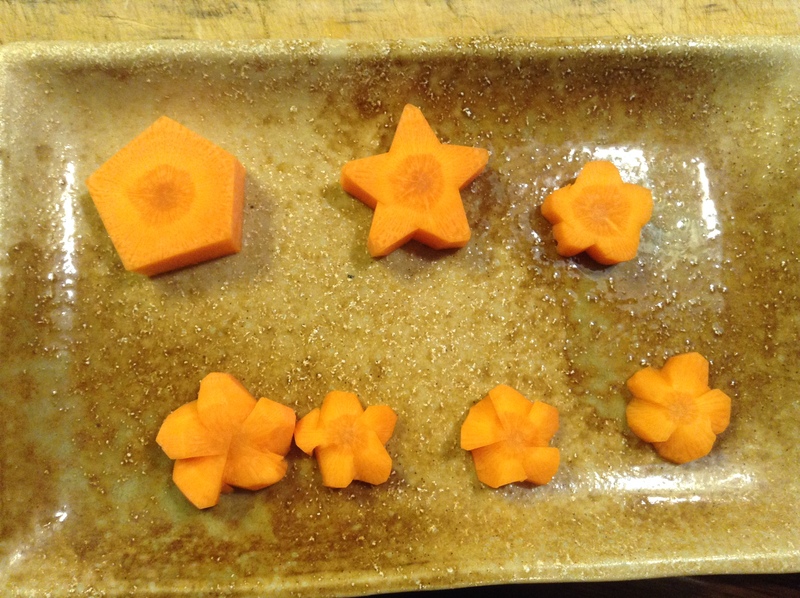 In spite of not finding your cutter for the plum blossom carrots, I think the outcome was wonderful. The mere hint of rusticity was perfect in the final photo of the finished dish. Thanks for all your hard work and dedication that you bring to your site and writing. Loved reading your book last month. Arigato for your kind words. I’ve already been inspired for a new carrot next year. Stay tuned! Thank you so much for this wonderful introduction to japanese food for New Year. My sister who is living near Kobe have tried to explain it to me. But now I understand what it is all about. So interesting to see what you can make of many of the same ingredients as we have in Denmark.